Design freelancing is a promising adventure which will guide you through a series of challenging obstacles and test your skills in mind-bending situations where the power of your spirit and your will to survive in the design freelancing career will determine the final results of your journey. Freelancing offers a flexible career path with lots of opportunities for growth. It is a celebration of knowledge and willpower, intertwined with individuality and belief. Belief for a better future where financial independence, recognition, and time flexibility are granted by default. Entangled in our own dreams of a world that celebrates creativity in all its form, we often trip down the path of bewilderment. Young and inproficient in our industry of choice, we fall in the trap of false promises, hoping on a pledged fate of prospect. Yet, not long after we take our first steps towards changing our lives for good, reality hits us hard and we’re left with no choice other than starting our journey all over again or ending it for the better. In the world of design freelancing, having false expectations is one of the worst career-wreaking mistakes one could make. Laying out our ideas and having a reality check of the prospects of your success can help you avoid falling in challenging situations and aid you in achieving your goals easier. The life of the freelance designer is often subjected to a specific lifestyle. An existence that embraces individualism and celebrates deprivation as a primal factor for creativity. This misconceived reality tricks most freelance designers into believing a life without affluence is a life worth living. But looking at this situation from a different aspect can help you understand the truth. Capital is the driving force of success and it is the monetized version of appreceation. And isn’t that what’s we’re all hoping for in the end? Giving away your work for free devalues your skills. Think about this the next time you consider accepting a pro-bono project in return of uncertain promises. Finding a source of inspiration hides not in the end result, but in the journey itself. Inspiration is not a single subject, nor can it be systematized, categorized or taught. Inspiration is the beginning of the process of creation. It is a complex mechanism which is triggered by the aspirations, memories and experiences of an individual. It cannot be copied and reproduces and it will not work the same way for others as it works for you. At least, not with certainty. One should work alone in the proccess of finding inspiration and rely more on his gut feeling, rather than absorbing meaningless information and images until it clicks. Inspiration should be invited within the individual’s mind rather than chased outside of it. Feed your creativity with memories, feelings and stories and you’ll be able to create truly impactful artwork that stands the tests of time and surpasses current trends. 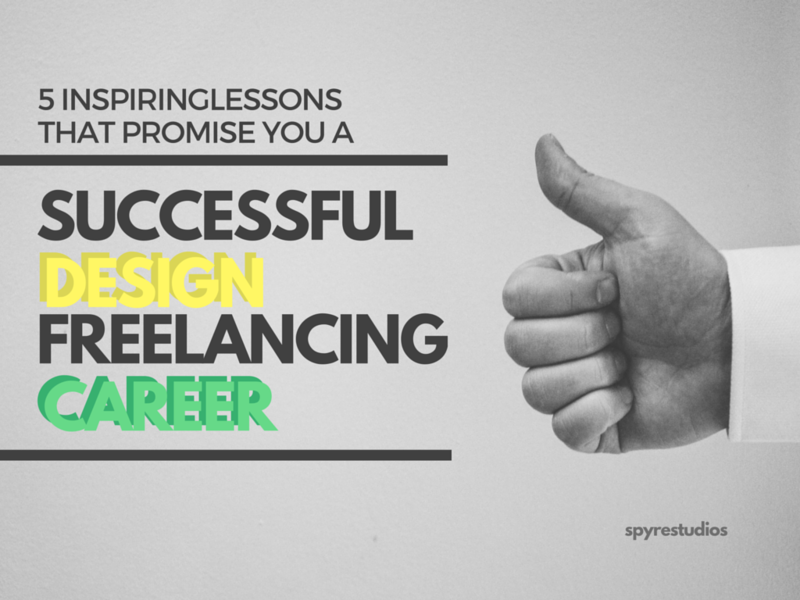 Design freelancing is a complex process that can lead you to many career growth opporutnities. It involves continuous work with clients and requires that you build strong relationships with prospect customers to secure an ongoing work flow. In our attempt to succeed, we tend to think that walking in the footsteps of a lucrative person will secure our own prosperity. Progress is different for everyone and the journeys we embark in weave our fate in different ways. Yet, the road changes each and every second and shapes according to our own lives. This is why, when entering the design freelancing career parth, you need to build your own way and follow the parth that you feel is best for you instead of expecting prosperity to come to you, guided by a certain ritual of course of actions. Life works differently for all of us and we need to live it how we feel it’s best for us in order to achive the goals we desire. Being a freelance designer requires strong determination and a clear idea. Without having a positive vision for what comes ahead, you’re bound to struggle, trying to determine if the path you’ve taken will lead you on the better side of the road. Taking fate in your hands is the most promising way to a sucessful career as a freelance designer. Building a great client base and growing your business depends on your actions and every good projects starts our with a clean plan. Having the ability to visually representing your ideas can help you clearly project your ideas into the reality. Take a pen and scribble down all the goals, dreams and aspirations you have for your future and a freelance designer and follow your path to success. Designing his own life is the most challenging, yet, the most rewarding project a freelance designer could take. Once you get a clear idea of what the future should hold for you, you’ll find it easy to achieve your goals and proceed to developing a fruitfull career in the freelance design industry.